For many of us, one Christmas stands out from all the others, the one when the meaning of the day shone clearest. Although I did not guess it, my own truest Christmas began on a rainy spring day in the bleakest year of my life. Recently divorced, I was in my 20's, had no job, and was on my way downtown to go the rounds of the employment offices. I had no umbrella, for my old one had fallen apart, and I could not afford another one. I sat down in the streetcar, and there against the seat was a beautiful silk umbrella with a silver handle inlaid with gold and flecks of bright enamel. I had never seen anything so lovely. I examined the handle and saw a name engraved among the golden scrolls. The usual procedure would have been to turn in the umbrella to the conductor, but on impulse I decided to take it with me and find the owner myself. I got off the streetcar in a downpour and thankfully opened the umbrella to protect myself. 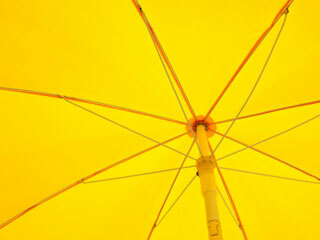 Then I searched a telephone book for the name on the umbrella and found it. I called, and a lady answered. Yes, she said in surprise, that was her umbrella which her parents, now dead, had given her for a birthday present. But, she added, it had been stolen from her locker at school (she was a teacher) more than a year before. She was so excited that I forgot I was looking for a job and went directly to her small house. She took the umbrella, and her eyes filled with tears. The teacher wanted to give me a reward, but -- though $20 was all I had in the world - - her happiness at retrieving this special possession was such that to have accepted money would have spoiled something. We talked for a while, and I must have given her my address. I don't remember. The next six months were wretched. I was able to obtain only temporary employment here and there, for a small salary, though this was what they now call the Roaring Twenties. But I put aside 25 or 50 cents when I could afford it for my little girls Christmas presents. (It took me six months to save $8.) My last job ended the day before Christmas, my $30 rent was soon due, and I had $15 to my name -- which Peggy and I would need for food. She was home from her convent boarding school and was excitedly looking forward to her gifts the next day, which I had already purchased. I had bought her a small tree, and we were going to decorate it that night. Peggy was not yet six years old, and had been alone all day while I worked. She had set our kitchen table for our evening meal, proudly, and put pans out and the three cans of food which would be our dinner. For some reason, when I looked at those pans and cans, I felt broken-hearted. We would have only hamburgers for our Christmas dinner tomorrow, and gelatin. I stood in the cold little kitchen, and misery overwhelmed me. For the first time in my life, I doubted the existence of God and His mercy, and the coldness in my heart was colder than ice. The doorbell rang, and Peggy ran fleetly to answer it, calling that it must be Santa Claus. Then I heard a man talking heartily to her and went to the door. He was a delivery man, and his arms were full of big parcels, and he was laughing at my child's frenzied joy and her dancing. This is a mistake, I said, but he read the name on the parcels, and they were for me. When he had gone I could only stare at the boxes. Peggy and I sat on the floor and opened them. A huge doll, three times the size of the one I had bought for her. Gloves. Candy. A beautiful leather purse. Incredible! I looked for the name of the sender. It was the teacher, the address simply California, where she had moved. Our dinner that night was the most delicious I had ever eaten. I could only pray to myself, Thank You, Father. I forgot I had no money for the rent and only $15 in my purse and no job. My child and I ate and laughed together in happiness. Then we decorated the little tree and marveled at it. I put Peggy to bed and set up her gifts around the tree, and a sweet peace flooded me like a benediction. I had some hope again. I could even examine the sheaf of bills without cringing. Then I opened the two white envelopes. One contained a check for $30 from a company I had worked for briefly in the summer. It was, said a note, my Christmas bonus. My rent! The other envelope was an offer of a permanent position with the government -- to begin in two days after Christmas. I sat with the letter in my hand and the check on the table before me, and I think that was the most joyful moment of my life up to that time. The church bells began to ring. I hurriedly looked at my child, who was sleeping blissfully, and ran down to the street. Everywhere people were walking to church to celebrate the birth of the Saviour. People smiled at me and I smiled back. The storm had stopped, the sky was pure and glittering with stars. The Lord is born! Sang the bells to the crystal night and the laughing darkness. Someone began to sing, Come, all ye faithful! I joined in and sang with the strangers all about me. Janet Miriam Holland Taylor Caldwell (September 7, 1900 - August 30, 1985) was a prolific and best-selling American author.